This home was impeccably renovated with attention to design and detail. The furnishings reflect the understated elegance that you will find throughout the apartment. The gracious layout is perfect for entertaining and sophisticated living. The entry foyer opens to a center gallery fabulously decorated with a dramatic lighting piece. Both the dining room and the expansive living room flow from this spot. There are newly installed wood floors throughout these rooms with custom Natural Walnut cabinetry. There is a split bedroom configuration in the apartment. The large master bedroom suite is a private and luxurious retreat with a considerable walk-in closet, an additional storage closet and a windowed spa-like bath featuring Waterworks fixtures. The spacious second bedroom is currently used as an office and den, and has two large closets and Natural Oak cabinetry. The perfectly aligned kitchen is fabulous, and a testimony to matching all Caesarstone counters, cabinets and appliances. A wolf stove/oven, subzero refrigerator/freezer and a Viking microwave are included. A Bosch washer and dryer are enclosed within the cabinetry as well. All AC units were updated and replaced as a part of the apartment renovation. 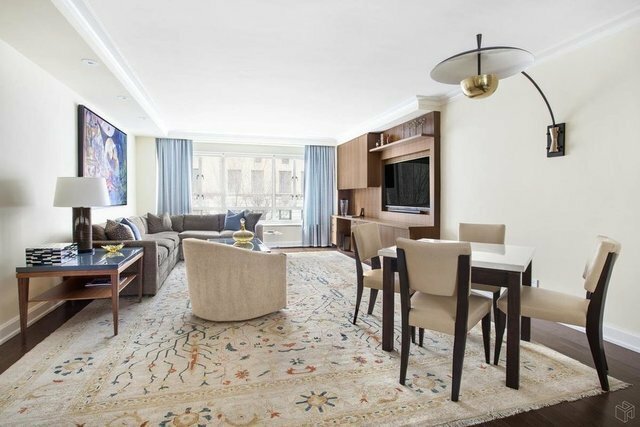 799 Park Avenue is a full service, white glove cooperative, conveniently located between 74th and 75th street, with the entrance on Park Avenue. There is a live-in Resident Manager, 24hr doorman, and elevator operator. The amenities include a state of the art gym, an outdoor garden area, central laundry room, garage parking and storage.